The portable measuring microscope convinces by the unbeatable cost-performance ratio. A 10x achromatic objective and a micrometric eyepiece, which is divided into 0.1 mm by a reticle, form only part of the features of our measuring microscope. By an adjustable battery powered xenon inspection lamp at the measuring microscope a very good lighting is also possible without a network connection close to the measuring microscope. You can set the measuring microscope's focus by using the rack and pinion drive, so you can get the perfect view for examination with the measuring microscope. 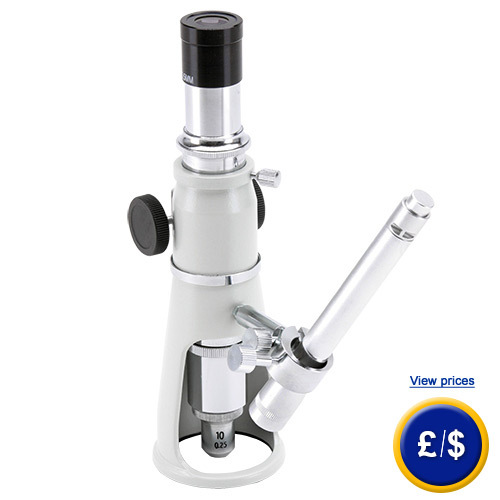 If there are any questions about this measuring microscope, please have a look at the technical specification below or call: UK customers +44(0) 23 809 870 30 / US customers +1-410-387-7703.. Our engineers and technicians will gladly advise you regarding microscopes or any other products in terms of measuring instruments regulation and control, or scales and balances of PCE Instruments.